TORONTO, ONTARIO--(Marketwired - Feb. 27, 2017) - Teranga Gold Corporation ("Teranga" or the "Company") (TSX:TGZ)(ASX:TGZ) is pleased to announce initial results from its exploration drilling program at its Niakafiri deposit on the Sabodala mine license in Senegal, West Africa. "We are pleased to be drilling at Niakafiri. With the resumption of drilling, we believe there is considerable opportunity to upgrade the existing resources and reserves. With results received from 27 of the 115 planned holes, we are encouraged by the favourable results thus far," stated Paul Chawrun, Chief Operating Officer of Teranga. The majority of the Niakafiri suite of deposits were delineated at the inception of the Sabodala project in 2009 and represents a combined measured and indicated resource of approximately 600,000 ounces, an inferred resource of approximately 220,000 ounces and reserves of over 300,000 ounces(1) included within the total resource estimate (see Table 1A in Appendix 1). 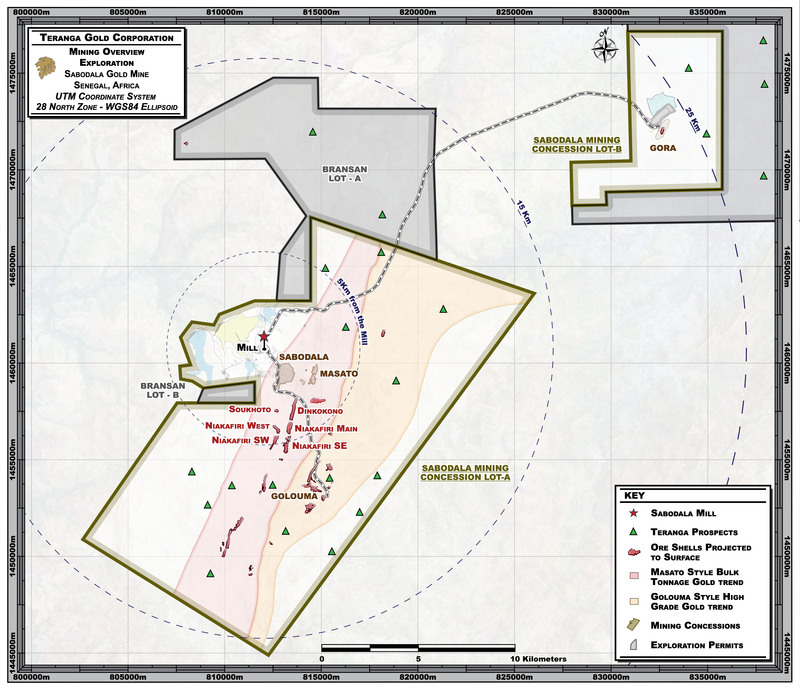 These resources and reserves have been delineated near surface with the oxide zone extending at depth and are approximately 3 kilometres from the Sabodala mill (see Figure 1 in Appendix 1). Further development drilling of Niakafiri resources was halted until Teranga was able to access these areas with stakeholder support. Since re-initiation of this program with one drill in late 2016, we have increased present activity to four drills in order to complete the drilling in time for inclusion in an updated mid-year resource and reserve statement. Added David Mallo, Vice President Exploration of Teranga, "The Niakafiri drilling program will continue throughout 2017 as we seek to upgrade resource classification, infill gaps between resource outlines and evaluate mineralisation along strike of the deposits." 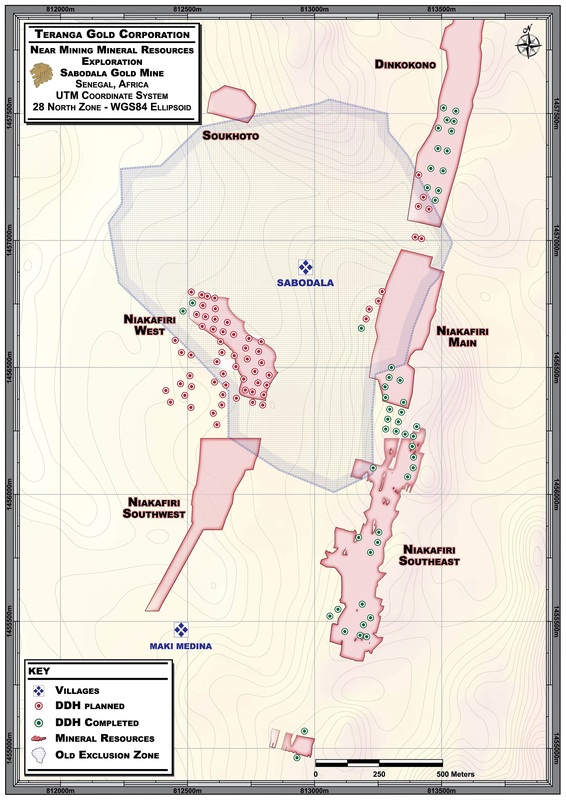 The current phase of the Niakafiri drill program consists of 115 proposed core holes totaling 12,000 metres to be drilled at four components of the Niakafiri deposit; Niakafiri Main, Niakafiri Southeast, Niakafiri West and Dinkokono (see Figure 2 in Appendix 1). The most advanced portion of Niakafiri is the eastern component where most of the current drilling program has been completed and all reported results are located. The majority of the planned 2017 drilling is at Niakafiri West where the objectives are to upgrade the resource categories and to fill in a gap of approximately 1.5 kilometres along Niakafiri West extending northwards towards known mineralization at Soukhoto. An additional phase of drilling will be undertaken based on interpretation of the results from the current program. The results received to date from the eastern portion of the Niakafiri deposit drilling (see Figure 2 in Appendix 1) are encouraging. We have successfully filled in gaps between previously outlined resource pit shells, extended mineralization up-dip in a number of areas of the deposit and successfully filled in previous widely spaced drill intersections. In addition, a number of near surface high grade intercepts have been received from the initial assay results (see Table 1 on the next page). Furthermore, the results from all components of the current Niakafiri drill program will be incorporated into an updated mid-year resource and reserve statement. The current Niakafiri resource and reserve base estimation is outlined in Tables 1A and 1B (see Tables 1A & 1B in Appendix 1). Pending further favourable results at Niakafiri, the Company expects to further evaluate the impact on pit sequencing in the life of mine plan and the timing of village relocation. A listing of the favourable drill hole intersections currently available from the eastern portion of the Niakafiri deposit is outlined in the following Table 1, while the complete listing of drill results for all 27 holes currently available from this extensive drill program is included in Table 2 (see Table 2 in Appendix 1). (1) Proven and Probable reserves of 8.95 Mt at 1.09 g/t for 314 Koz (see Table 1A in Appendix 1). The technical information contained in this Report relating to mineral resource estimates for Niakafiri is based on, and fairly represents, information compiled by Ms. Patti Nakai-Lajoie. Ms. Nakai-Lajoie, P. Geo., is a Member of the Association of Professional Geoscientists of Ontario, which is currently included as a "Recognized Overseas Professional Organization" in a list promulgated by the ASX from time to time. Ms. Nakai-Lajoie is a full time employee of Teranga and is not "independent" within the meaning of National Instrument 43-101. Ms. Nakai-Lajoie has sufficient experience which is relevant to the style of mineralization and type of deposit under consideration and to the activity which she is undertaking to qualify as a Competent Person as defined in the 2012 Edition of the "Australasian Code for Reporting of Exploration Results, Mineral Resources and Ore Reserves". Ms. Nakai-Lajoie is a "Qualified Person" under National Instrument 43-101 Standards of Disclosure for Mineral Projects. Ms. Nakai-Lajoie has consented to the inclusion in this Report of the matters based on her compiled information in the form and context in which it appears in this Report. This press release contains certain statements that constitute forward-looking information within the meaning of applicable securities laws ("forward-looking statements"), which reflects management's expectations regarding Teranga's future growth, results of operations (including, without limitation, future production and capital expenditures), performance (both operational and financial) and business prospects (including the timing and development of new deposits and the success of exploration activities) and opportunities. Wherever possible, words such as "plans", "expects", "does not expect", "budget", "scheduled", "trends", "indications", "potential", "estimates", "predicts", "forecasts", "anticipate" or "does not anticipate", "believe", "intend", "ability to" and similar expressions or statements that certain actions, events or results "may", "could", "would", "might", "will", or are "likely" to be taken, occur or be achieved, have been used to identify such forward looking information. Forward-looking statements include, without limitation, all disclosure regarding possible events, conditions or results of operations, future economic conditions and anticipated courses of action. Although the forward-looking statements contained in this press release reflect management's current beliefs based upon information currently available to management and based upon what management believes to be reasonable assumptions, Teranga cannot be certain that actual results will be consistent with such forward looking statements. Such forward-looking statements are based upon assumptions, opinions and analysis made by management in light of its experience, current conditions and its expectations of future developments that management believe to be reasonable and relevant but that may prove to be incorrect. These assumptions include, among other things, the ability to obtain any requisite governmental approvals, the accuracy of mineral reserve and mineral resource estimates, gold price, exchange rates, fuel and energy costs, future economic conditions, anticipated future estimates of free cash flow, and courses of action. Teranga cautions you not to place undue reliance upon any such forward-looking statements. The risks and uncertainties that may affect forward-looking statements include, among others: the inherent risks involved in exploration and development of mineral properties, including government approvals and permitting, changes in economic conditions, changes in the worldwide price of gold and other key inputs, changes in mine plans and other factors, such as project execution delays, many of which are beyond the control of Teranga, as well as other risks and uncertainties which are more fully described in Teranga's Amended and Restated Annual Information Form dated November 15, 2016, and in other filings of Teranga with securities and regulatory authorities which are available at www.sedar.com. Teranga does not undertake any obligation to update forward-looking statements should assumptions related to these plans, estimates, projections, beliefs and opinions change. Nothing in this report should be construed as either an offer to sell or a solicitation to buy or sell Teranga securities. All references to Teranga include its subsidiaries unless the context requires otherwise. Since its initial public offering in 2010, Teranga has produced more than 1.2 million ounces of gold from its operations in Senegal. Following its recent acquisition of Gryphon Minerals, the Company is fast-tracking the completion of a feasibility study for the Banfora Project. Concurrent with its production and development activities, exploration programs are underway to seek to increase the Company's reserve base through resource conversion and making new discoveries. Teranga has a strong balance sheet and the financial flexibility to continue to grow its business. The Niakafiri Main deposit is adjacent to the Sabodala village and relocation of at least some portion of the village will be required which will necessitate a negotiated resettlement program with the affected community members..